Eclipse Indigo Democamp at Microsoft! World peace may be next! Today the Eclipse Indigo Democamp in the Netherlands, was held at the Schiphol/Amsterdam office of Microsoft Nederland. This unexpected mix of topic and venue raised many eyebrows (and tweets) in the Dutch developer communities on both sides. It turned out to be a very a very informative and enjoyable evening, with seven presentations in all. Wim Hoek of Microsoft Nederland welcomes all visitors to this democamp and refers to various tweets about the meeting of these two camps. The reason is simple: Microsoft is about developers, developers, developers. And that includes developers using Eclipse. Yuri Kok of Industrial TSI welcomes and explains the program. Wim Jongman, eclipse committer on ECF and with Industrial TSI, introduces Orion with some quiz questions, but he does not get to give away many prizes. Next he talksed about how to run OSGi with plugins et all inside an web or application server, allowing Eclipse developers to leverage their RCP/plugin skills on the server. About 30 people attended, I suspect mostly from the Dutch Eclipse world. Jos Warmer presented a case about using modelling in the insurance industry with an RCP client with a graphical policy design editor, based on Graphiti and created with Spray, a DSL to generate Graphiti shapes. Note that Spray will become OSS at sometime in the future! Currently the link leads to an empty project. Next was a break with very nice hospitality in the very impressive Microsoft building, thank you Microsoft! It's obvious that Dutch meeting rooms are best suited to native Dutchmen, the tallest people in the world after the Masai. But that didn't prevent Martin Woodward to give a very fast and extensive presentation on Microsoft Team Foundation Server and demonstrating the Team Foundation Eclipse (TFE) plugin. TFE is truly a first class citizen on Team Foundation Server, running fast and well integrated on an Eclipse instance running on a MacBook pro. This may be a very good solution for developer shops running windows and other platforms (Mac/Linux/Mobile) and integrates access from Visual Studio and Eclipse into one ALM solution. I like the concept of gated commits: requiring successful CI tests before actual committing. Other found it interesting as well as many people wanted more info afterwards instead of going out for the break. Teun Hakvoort talked about his experiences using the Windows Azure cloud platform for running a Java Enterprise container. Possible but not ready for prime time. Finally Manuel Polling of Edmond Document Solutions talked about the use of an RCP based workbench for professional document workflow solutions and their switch to and experience developing a graphical workflow editor. The evening concluded with lively discussions over drinks. Thank you to Microsoft and Industrial TSI! The Eclipse Wiki says there are two connectors to use Mylyn with GoogleCode and/or Eclipse Labs. Unfortunately both are in alpha state and have seen little action lately. That is the reason for the deliberately provocative title of this post. Googlecode Mylyn Connector is licensed under Eclipse Public License 1.0. This is the more extensive project, but is has a few open issues that depend on issues with GoogleCode's API itself. So the GoogleCode API must first expose more functionality for this connector to move past alpha. Issue 11 Support querys with filters, this may relate to problems formulating server side queries as well. Project Hosting connector for Mylyn is licensed under Apache License 2.0. ... One of the main goals of the project is to have a similar look-and-feel for the user interface to the one already provided on Google Code. The functionality is limited to read-only interaction at this time, but ability to enter new issues is under development. The project has two members. Reading the project site it seems that it is read only access and focus on HTML layout in the editor. Not a lot appears to be happening here so I think this project is abandoned. Mylyn is the biggest develper productivity enhancer in recent years. Many commercial SCM vendors provide connectors made by or helped by Tasktop. Google depends on and contributes to Eclipse in a big way (WindowBuilder, CodePro Analytix, AppEngine). I strongly feel that OSS community deserves a good Mylyn connector for the very accessible open source repository where SCM, Issue tracking and documentation all come together that is provide by Google Code/EclipseLabs! So this should be taken to the next step. So I'm going to volunteer at the Googlecode Mylyn Connector to help resolve some of the Mylyn specific issues using everything I learned contributing to Mylyn itself and creating the Industrial Mylyn Connector for connecting to SQL databases. But I'm also calling on readers of of this blog and Planet Eclipse to add comments and votes/stars to the issues in the GoogleCode Support pages listed above to raise the profile. Yesterday I blogged about setting up Eclipse Orion on MAc OSX and trying to access it from an iPad. Today I continue my exploration and share some comments on setup tuning and clarifications of the as yet sparse documentation on the Orion Eclipsepedia. 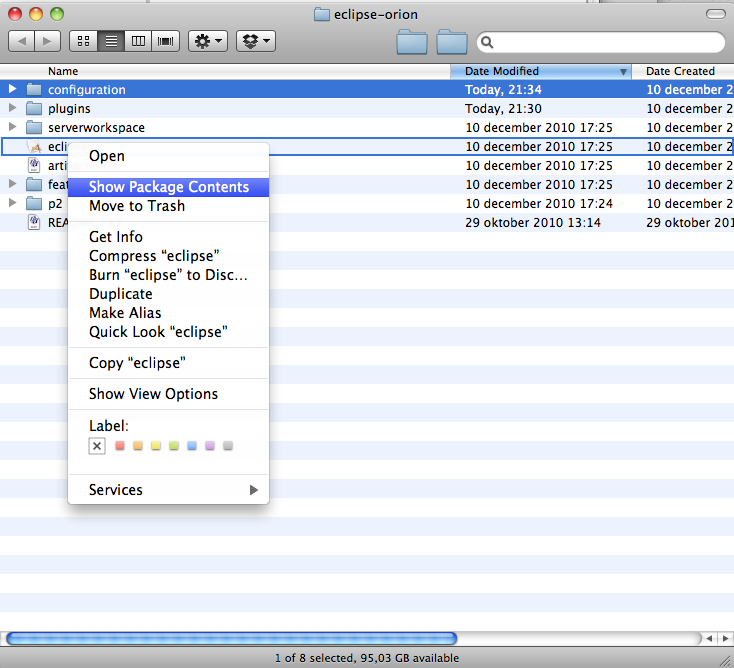 Open the eclipse package using control-click and Show Package Contents. Create an alias to the file Contents/MacOS/eclipse. Rename this alias to eclipse-orion to the root folder. Now you can double click the alias and orion is started but you have access to the osgi console in a Terminal window. To stop and shutdown orion simple type close in the Terminal window. I can open files and view them and move around with the outline bar at the left, but as yet I have failed to activate editing mode on a file. Clicking in the text or scrolling by dragging doesn't work. I suspect that the HTML used simply does not activate the keyboard on an iPad. 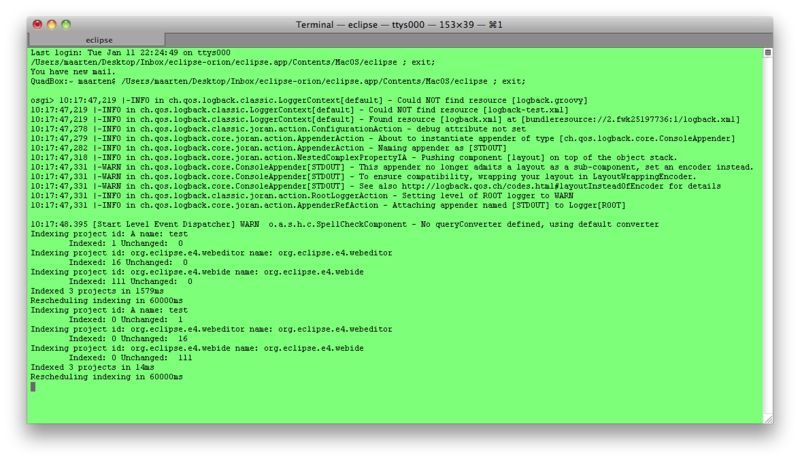 As iPad doesn't support Java, there is no Eclipse on it, until now! Because the iPad comes with Safari, a very good standards compliant webkit based browser, looking for a web based IDE does indeed make sense. So I'm very excited about the Orion announcement as can be found here, here and here. Download from http://download.eclipse.org/e4/orion/. I choose the version for Mac OSX. It extracts into a folder named eclipse that I renamed immediately to eclipse-orion to avoid confusion with all the other versions installed on my machine. Port 8080 is already taken on my system I needed to edit the config.ini file and change the org.eclipse.equinox.http.jetty.http.port variable. Then locate config.ini inside the Contents/MacOS folder. Then edit to choose the port that is free. 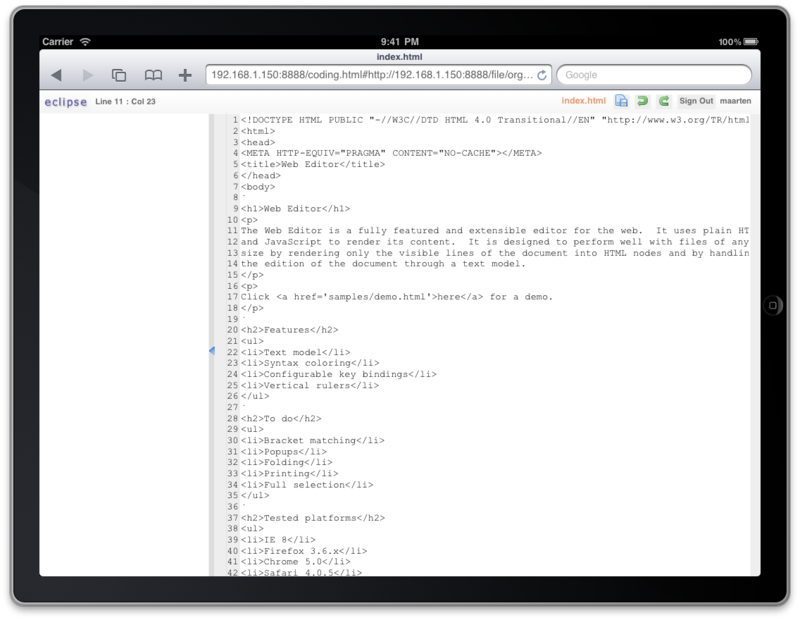 Open the iPad simulator, start Safari and go the URL http://ip-address-of-dev-machine:8888/ and see the workspace. Now you can edit files of your mobile website and save and see them in action right on the couch. Next time: hooking up to an existing workspace.